If you want to build more muscle, or are reaching plateaus in your gains, you need to find ways to start jacking up the intensity levels. We want to absolutely maximize muscle fiber recruitment, metabolic stress, muscle damage…all those things that correlate positively with muscle growth. So here’s 6 things you can do. 6 techniques you’ve never heard of, forgotten about, or just aren’t utilizing. Don’t let the weird title scare you. On page 73 of The Wisdom of Mike Mentzer he recommends infitonic training. Basically it’s a form of ‘rest-pause’ with maximum weight but…the negative aspect of the rep is also maximized. Get a buddy to spot you. Perform the positive part of that 1 rep max with perfect form then…. Lower very slowly indeed – basically as slowly as is humanly possible for you. This 1 single rep will expose the intended muscle to a higher intensity of muscular contraction than it has perhaps ever experienced before. This is the “mechanical tension” aspect of stimulating growth. 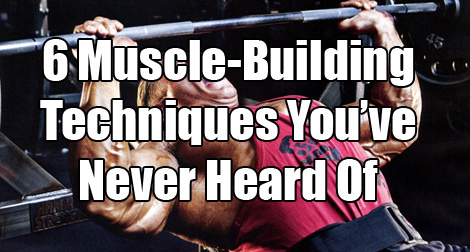 This is an “omni contraction” and can really trigger new gains in the worked muscle. Arnold was right on this. Although he was just doing it intuitively, I have read a study demonstrating that guys can lift more when they visualize the muscle in question (and unfortunately I can’t find that study again). This is obviously a closed-eye process. My own opinion on this is that this actually increases “neuro-muscular efficiency“. Remember that muscle fibers are recruited as a signal sent from the brain through the nervous system. The better the efficiency of this signal, the bigger and better your lifts are going to be and, as a result, the better your gains will be. Now in THT training I do not recommend you do this after every set. The fatigue generated will mean successive sets are adversely affected i.e. you’ll be much weaker. This is “drop-setting” with as little rest in between as possible. Meditation has been shown to lower cortisol levels and produce more testosterone and growth hormone . While cortisol is not “bad” when it is released at the correct times, (like in the morning to wake you up) chronically high levels will hurt your gains. Meditation lowers the chronic levels of cortisol that some people experience as a a result of stress. Stress also has the opposite effect on testosterone and growth hormone – the higher the stress, the lower the levels of these anabolic hormones. Meditating regularly helps set up an optimal anabolic environment inside your body. If you like new and exciting strategies that take you beyond normal training and normal results, you’ll LOVE my Chest Blast and Arms Blast routines. 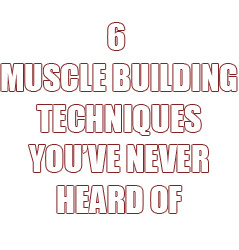 They contain strategies like the above (and more you’ve never heard of). In fact, many trainees report to me, “I’ve never trained like this before!”. Just want to start gaining? Download THT and start gaining for free. See the results other guys have achieved here. Can’t wait to try some of those omni contractions in my training later today! I worked out with Mike Mentzer in the early ’70’s and yes he promoted 1-rep set, however he did plenty of warm up sets to get to that 1-rep set. Great article Mark!! I like the meditate part. My best gains come when I have my life and mind in order. A.K.A. Everything is going good!! Thank You Again For Your Dedication To Your “MuscleHackers”!!! !